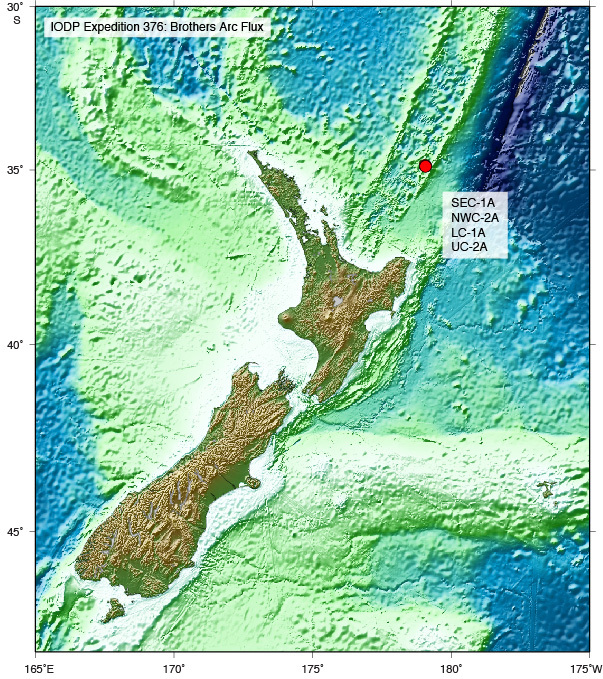 Expedition 376 will investigate the fundamental, interrelated processes governing subseafloor hydrothermal activity at Brothers volcano, southern Kermadec arc (IODP proposal 818-Full2). The primary objectives are to (1) Characterize the subsurface, magma-derived volatile phase for testing models predicting the existence of either a single-phase gas or a two-phase brine-vapor; (2) Explore the distribution of base and precious metals and metalloids at depth as well as the reactions that have taken place during their precipitation along fluid migration pathways to the seafloor; (3) Quantify the mechanisms and extent of fluid-rock interaction, and what this implies for the mass flux of metals and metalloids to the ocean as well as the role of magma-derived carbon and sulfur species in acting as agents for those fluxes; and (4) Assess the diversity, extent, and metabolic pathways of microbial life in an extreme, acidic, and metal-toxic (sub)volcanic environment. The ultimate scientific goal of Expedition 376 is to discover the key processes that distinguish submarine arc-hosted hydrothermal systems from those linked to spreading centers, which results from the flux of magmatic fluid commonly being much higher in volcanic arcs. As a consequence of their shallow water depths and high volatile contents, the magmatic-hydrothermal arc signature gives rise to different fluid compositions and thus mineralization compared to submarine extensional settings. This likely also has consequences for the associated biota. Additionally, given the very acidic fluids and high metal concentrations, submarine arc hydrothermal systems are thought to be important analogs to porphyry copper, epithermal gold, and various volcanic rock-hosted massive sulfide deposits mined on land. Drilling Brothers volcano will provide essential information for understanding the formation of those mineral deposits and will also reconstruct the volcanic stratigraphy of this arc volcano. Operations will focus on discharge zones of geochemically distinct fluids in and around the caldera of Brothers volcano by drilling and logging to 100s of m. The drill sites show variable impact of magmatic volatiles, which will enable the expedition to directly study the implications of magma degassing for the transport of metals to the seafloor and how this affects the functioning of microbial life. 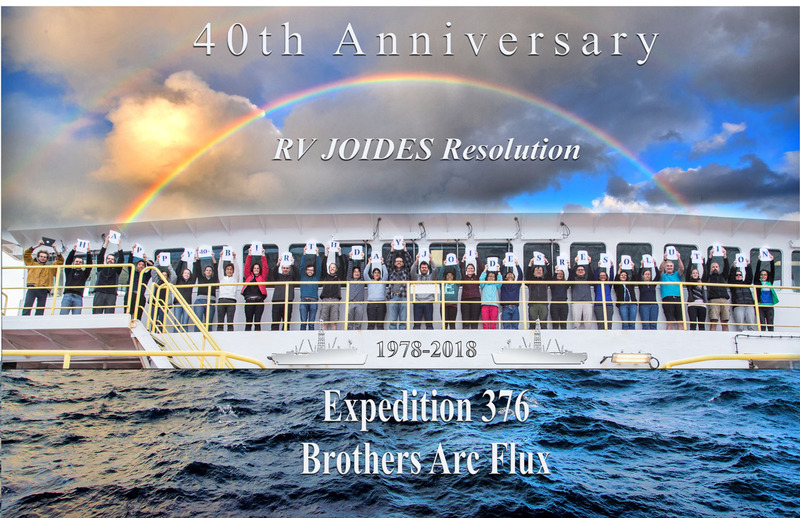 To learn more about the scientific objectives of this expedition and the technical plans, please join a web-based seminar on Wednesday, 15 March 2017 at 1:00 pm EDT (日本時間：3月16日 午前2時 ). To participate in the webinar, you need access to the Internet and a computer with a speaker and microphone (optional). To register, click the following link: Exp 376 webinar. 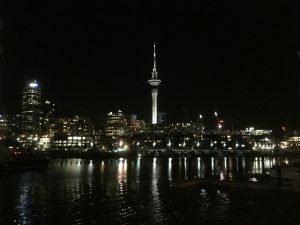 今航海は10か国 (日本、イギリス、ニュージーランド、アメリカ、ドイツ、中国、カナダ、ブラジル、韓国、オーストラリア) から総勢30名の研究者が乗船しました。今後もこのメンバーで共同研究が行われ、Post-cruise meetingなどで再会する素晴らしい仲間ができたと言えるでしょう。また60日間という長い間、ルーペと顕微鏡でコア試料と向かい合い、陸上のペーパーワークのことを忘れて (笑)、これだけ研究に没頭できたのは快感でした。2か月の乗船期間は相当長いので、頻繁にIODP航海に乗船するのは研究のバランスを崩しそうですが、1つ言えるのはもっと若いうちに早くIODP航海に乗船してこの経験を積んでおけば良かったということです。またそう遠くないうちに、IODP航海に参加したいと思います!! 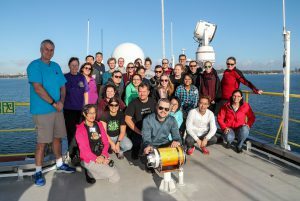 As a volcanologist working at the Japan Agency for Marine-Earth Science and Technology (JAMSTEC), I am one of the Japan-based researchers who have joined the IODP Expedition 376 to drill the hydrothermal system at Brothers Volcano in the Kermadec Arc. I am a member of the Physical Properties team that investigates the characteristics of the rocks that we are drilling. 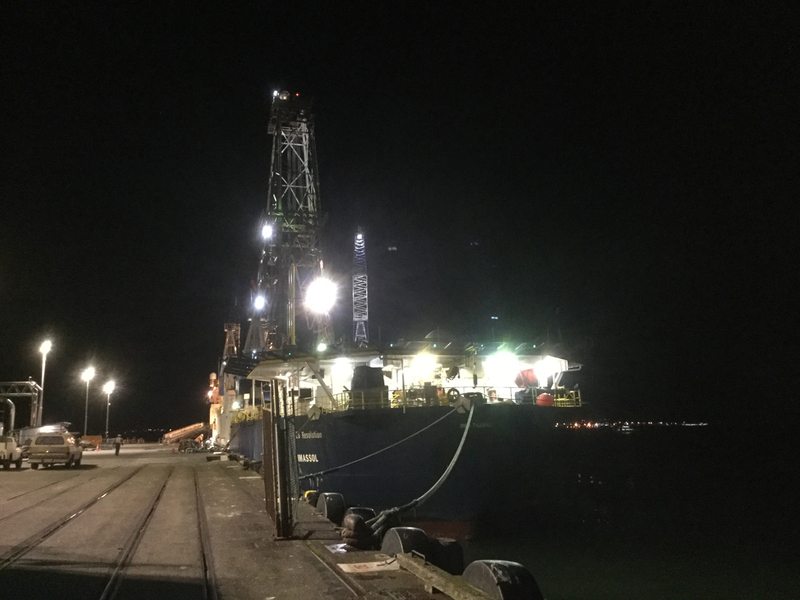 We make a number of different measurements on the recovered cores, which help us to link the rock types that we find to other geophysical datasets like downhole measurements or regional seismic surveys. For some measurements we cut a small piece of the core to work on. For example, we cut small cubes of rock and measure the change in their weight as they dry out. This tells us how much liquid can be held in the spaces within the rock. This is a particularly useful thing to know when we are trying to understand how hydrothermal fluids move through the different rocks of the volcano. In the photo below I am measuring the speed at which P-waves (a kind of seismic wave) travel through the rocks. For planning our drilling locations we have a cross-section image of the volcano that was made by a seismic survey, where seismic waves travel through the crust and are reflected back from different features. In this seismic image, we can see reflections that might be related to different rock types or growth stages of the volcano. We would like to drill down to some of these features, but we don’t know exactly how deep they are. 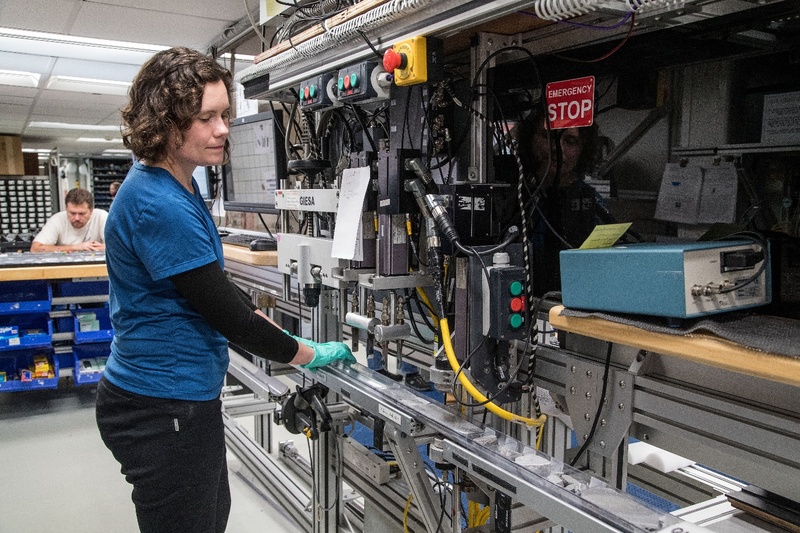 If we measure the P-wave velocities of the rocks that we are drilling through, then we know how long it took the seismic waves to travel through the volcano to make the seismic image – and from that we can know how deep we will have to drill to reach our targets! So it is fun to gather this data. In many ways we scientists are like impatient children during a long car journey, always asking “Are we there yet?” Of course everyone is excited to find out what the rocks are like at our particular targets, but in fact every rock that we recover as we drill down is a new and exciting discovery. 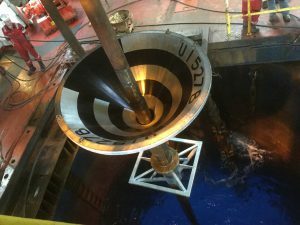 These kinds of measurements are slightly different to the research I normally do at JAMSTEC, where I am studying how magmatic gases affect how submarine volcanoes erupt, and the kinds of hazards that might be associated with them. I will be able to take some samples of the rocks we collect during this cruise back to JAMSTEC with me, where I will work to find out the gas content and eruption styles of the magmas at Brothers Volcano. I am interested to know how these compare to similar submarine volcanoes in the Izu-Bonin Arc near Japan, and what we can learn from them. 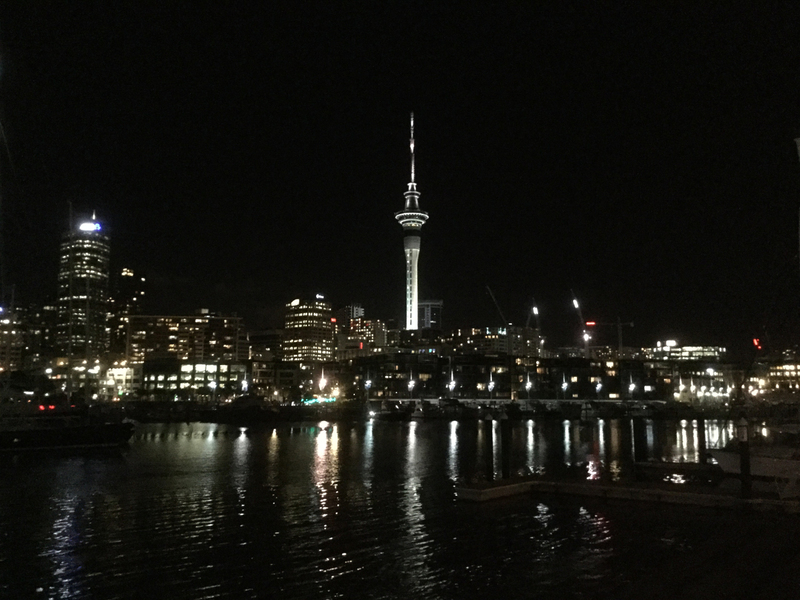 On the ship, it is very interesting to experience a new area of research, and I am enjoying learning different ways of studying submarine volcanoes and thinking about how I can improve my future research. 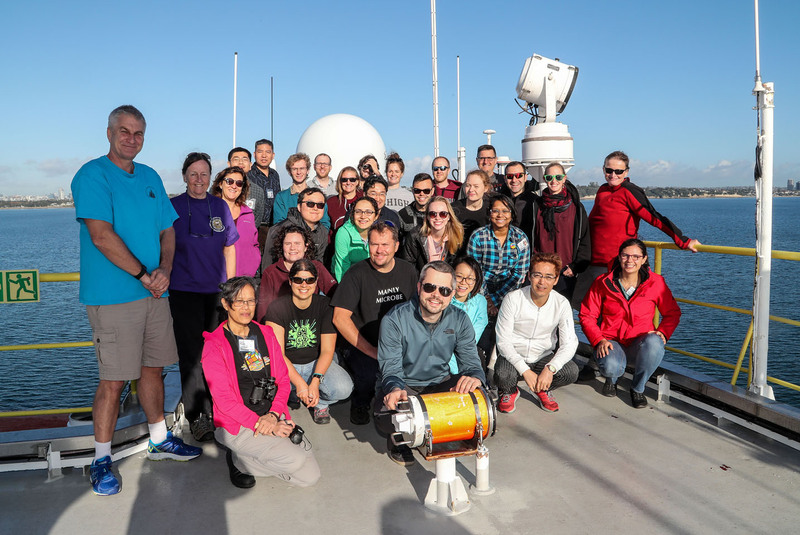 There are lots of discussions between all of the scientists and staff on board, who are all from different places and with different areas of expertise, and it is great to share our ideas and learn new things from each other. It also makes for a very interesting and sociable group of people to live and work with. People get together after their shifts are over to watch movies or sing karaoke, or go outside to enjoy the ocean view at sunrise and sunset. There is also a big effort to celebrate when people have birthdays. 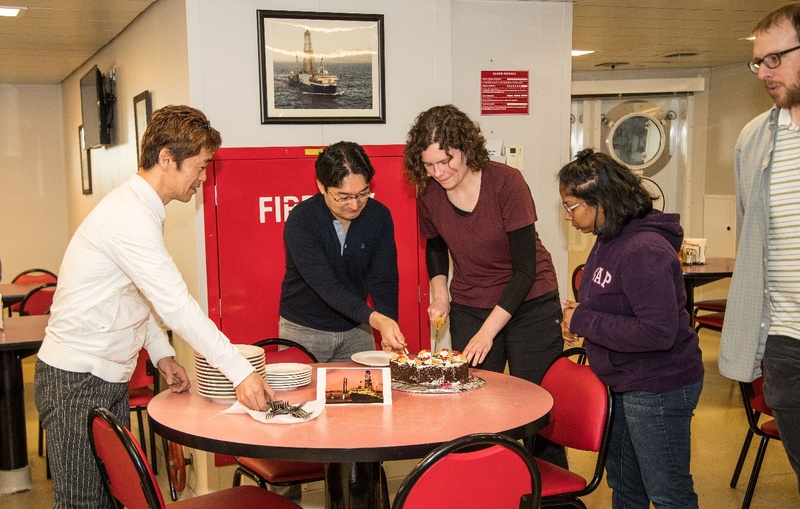 My birthday was a few weeks into the cruise, and the wonderful catering staff baked a delicious cake for everyone to share – here I am being assisted by JAMSTEC colleagues to make sure everyone can enjoy a slice!